For a candidate who's pushing for a change in congress, and for greater accountability on lobbying and spending, it does seem inappropriate for Obama to have earmarked $1,000,000 for a hospital that employs his wife. And when you consider that the same hospital awarded Michelle Obama with a promotion that came with 160% pay increase shortly after Barack Obama was elected to Senate, it further challenges Barack's credibility on the issue of lobbying. I'm a strong Obama supporter, and I've felt very comfortable supporting Obama in spite of the reaction I've received from my more contentious conservative friends. I have, however, come across an issue for which I cannot find a defense or excuse, and I'd like some clarity on the issue. The $1-million earmark for the Chicago Hospital where Michelle Obama works and received the monstrous pay-raise and promotion to a VP position poses an ethical problem (or at the least, a conflict of interest) for a candidate who is fighting against corruption in the government. This screams of a you-scratch-my-back/I'll-scratch-yours scenario, does it not? How has Barack responded to criticisms of this situation? This is a tremendous issue for me, because the only reason I went from being a staunch non-voter to an Obama supporter was because I was disgusted at the corruption that's built into the political system -- that our elected leaders should be influenced and corrupted by money is disheartening. I felt that Obama's campaign was built on fighting against such corruption. However, if this situation with Barack and Michelle is another example of that corruption, I will certainly not cast my vote. If/when the campaign gets back to me, I'll be sure to follow up. I would also criticize Michelle for her "If she can't control Bill she can't handle the White House" comments. If Obama can't keep his wife from making sexist campaign comments (or his own staff, or himself for that matter), can he handle that white house? Red - you and I weigh the issues differently. For you, evidence of sexism seems to weighs more heavily than evidence of racism and evidence of corruption. That's very odd to me, but I don't tend to question a person's held values. It is what it is. For me, the issue of corruption by way of dollars is my chief concern. In the same way you don't find Hillary's blatant lies and cozy open relationship with corporate lobbyists problematic, I don't find Michelle's statement about Hillary and Bill's relationship problematic. I find Michelle's statement about Bill and Hillary to be a valid one. It's sad that we have gotten to the point when somebody makes a valid comment about something a bunch of people have to jump up and complain about how offended they are. It's just a ruse to keep an issue from being brought up. If one candidate takes an opposite position from another, then that candidate is "attacking" the other. All this political correctness and sensitivty is undermining the political discourse that is necessary in a democracy. Politicans love it because they can focus on how offended they are instead of having to address an issue. I was sorry to hear that you are not a regular voter. If you dont vote, then dont complain. We, and not politicans, are the only source of real change. The reason we get the type of government we get is because people are not involved. Politicans have always been the same since the dawn of politics. It's like kids. When people say that kids have changed, they are wrong, it's parents who have changed. 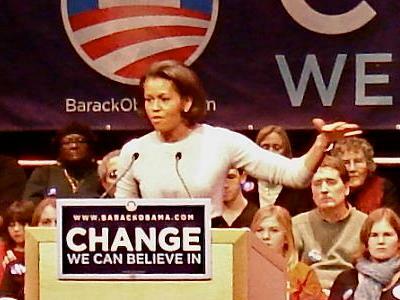 My point is dont expect politicans or politics to change, Obama included, unless voter habits change. fyi..Hillary was made a partner in the Rose Law Firm the day after Bill was made the Attorney General of Arkansas. I personally dont have a problem with M.O's hospital receiving a grant from the government depending on what the money is for. There should be some mechanism in place to enusre that the money is actually used for that purpose because of the appearance for impropriety. Mark - I dunno. I think I agree with Red that a personal attack on the history of the Clintons' marriage life is a low blow, and not relevant to the campaign. I don't agree that it's a sexist attack, because I think the same argument would be made if Hillary and Bill's roles were fully reversed. I think it's a statement about spouses in general, and not about gender roles or sexism. I disagree with your "don't complain if you don't vote" position. If I felt that each candidate was corrupt, I would vote for none of them. And I would feel comfortable pointing out the problems with their platform and administration. You could vote for a write in candidate. I know he/she would not get elected, but I feel its disprespectful to the millions who have died for our freedom to do nothing. I cant change the world, I can only control what I do is the way I look at it. This is what I mean about being accused of "attacking". Given Bills extramaterial affairs, his pardoning of terroists and felons for money, White Water, where they invested $6000.00 for a full partnership in an investment that lost $54 million and ever principal went to jail except them, Vince Foster's suspicious suicide, her petitioning the government to be the prosecuting attorney in a lawsuit filed against one of her business partners, her inability to produce law records for 4 years that were sitting in her office, the acceptance of money from the chineese for campaigns, the Lincoln bedroom scandle, Abscam, Travelgate and many other inappropriations should not be discussed because they are views as an attack? B.S. A candidates history is very important and is worth looking at. People that think character does not count are wrong. If one is to believe Washington, Voltair, Locke, Martin Luther King Jr., Ghandi and a host of other great minds, when it comes to leadership, character is the only thing that matters. But I guess we are not allowed to discuss it or make comment on it because its an "attack" Funny, a candidate seems to think its ok to bring up their history that highlights them. Why does it not work the other way. Additionally, when a candidate disgraces an office it erodes the power and prestige of that office making it difficult to bring about "hope" and "change" because they are politically damaged. It opens them up to being blackmailed by the person who caught them. And it undermines the trust of the people and make them choose to sit out an election and lose faith in their leaders. A stupid President or one that makes mistakes is one thing, electing a scoundrel is something else entirely. It reminds me of people defending Hitler because dispite the war and the "jew thing" he did turn the german economy around and build the autobahn and ordered the manufacturing the the volkswagon. You have to look at the whole picture and your past is fair game in politics. Did you think bringing up David Dukes past as a leader of the Klu Klux Klan was unfair when he ran for governer of Lousiana. It had nothing to do with politics..right? I'm with you on the earmark for MO's employer. If the University of Chicago needs money from the government, it knows how to get it. There are two Senators, and many congressmen/women from Illinois who could have done the earmarking. That Senator Obama personally submitted an earmark that directly benefitted his wife's employer, and that his wife was given a huge raise immediately after her husband's election to the Senate, is more than the typical "appearance of impropriety." Senator Obama should not have had any involvement, and should have refrained from participating, in any effort by MO's employer to get federal money. He is not a "new type of politician" as hyped. He is the same ol', same ol'. I asked around on some other forums regarding what other Obama supporters felt about that, and most of them said that the reason it didn't get any real attention in the news is because it isn't newsworthy; at that level, $1,000,000 is like pocket change for a university, and provided that the money was spent for the actual intended project, it's almost meaningless. So I'm stuck between wondering if this is an issue of corruption, or if it's simply an issue of putting a little money towards a project that Obama happened to agree with. And if that's the case, is showing a little bit of favorable bias the same thing as "corruption?" I don't know. I agree that it does feel like politics-as-usual, which is disheartening. But at the same time, Obama's platform pushes for full disclosure on this kind of spending, in order to prevent back-room deals that involve get-rich stakeholders at the expense of ordinary citizens. Giving money to a school might present us with a conflict of interest and the appearance of impropriety, but I don't think that's necessarily the same thing as corruption. At least, not the kind of corruption that Obama's campaign is fighting against.